Acute glomerulonephritis is an inflammatory disease of both kidneys predominantly affecting children from ages two to 12. Chronic glomerulonephritis can develop over a period of 10-20 years and is most often associated with other systemic disease, including diabetes, malaria, hepatitis, or systemic lupus erythematosus. Acute glomerulonephritis is an inflammation of the glomeruli, bundles of tiny vessels inside the kidneys. The damaged glomeruli cannot effectively filter waste products and excess water from the bloodstream to make urine. The kidneys appear enlarged, fatty, and congested. Acute glomerulonephritis most often follows a streptococcal infection of the throat or skin. In children, it is most often associated with an upper respiratory infection, tonsillitis, or scarlet fever. Kidney symptoms usually begin two to three weeks after the initial infection. Exposure to certain paints, glue or other organic solvents may also be the causative agent. It is thought that the kidney is damaged with exposure to the toxins that are excreted into the urine. The individual with chronic glomerulonephritis may discover their condition with a routine physical exam revealing high blood pressure, or an eye exam showing vascular or hemorrhagic changes. The kidneys may be reduced to as little as one-fifth their normal size, consisting largely of fibrous tissues. Diagnosis of glomerulonephritis is established based on medical history, combined with laboratory studies. A "dipstick" test of urine will reveal increased protein levels. A 24 hour urine collection allows measurement of the excretion of proteins and creatinine. Creatinine clearance from the bloodstream by the kidneys is considered an index of the glomerular filtration rate. Blood studies may reveal a low blood count, and may also be checked for the presence of a streptococcal antibody titer(a sophisticated blood test indicating presence of streptococcal infection). A kidney biopsy may also be performed, using ultrasound to guide the needle for obtaining the specimen. Bedrest helps in maintaining adequate blood flow to the kidney. If residual infection is suspected, antibiotic therapy may be needed. In the presence of fluid overload, diuretics may be used to increase output with urination. Iron and vitamin supplements may be ordered if anemia develops, and antihypertensives, if high blood pressure accompanies the illness. In order to rest the kidney during the acute phase, decreased sodium and protein intake may be recommended. The amount of protein allowed is dependent upon the amount lost in the urine, and the requirements of the individual patient. Sodium limitations depend on the amount of edema present. Fluid restrictions are adjusted according to the patient's urinary output and body weight. An accurate daily record of the patient's weight, fluid intake and urinary output assist in estimating kidney function. The patient must be watched for signs of complications and recurrent infection. As edema is reduced and the urine becomes free of protein and red blood cells, the patient is allowed to increase activity. A woman who has had glomerulonephritis requires special medical attention during pregnancy. In acute glomerulonephritis, symptoms usually subside in two weeks to several months, with 90% of children recovering without complications and adults recovering more slowly. Chronic glomerulonephritis is a disease that tends to progress slowly, so that there are no symptoms until the kidneys can no longer function. The resultant renal failure may require dialysis or kidney transplant. Prevention of glomerulonephritis is best accomplished by avoiding upper respiratory infections, as well as other acute and chronic infections, especially those of a streptococcal origin. Cultures of the infection site, usually the throat, should be obtained and antibiotic sensibility of the offending organism determined. Prompt medical assessment for necessary antibiotic therapy should be sought when infection is suspected. The use of prophylactic immunizations is recommended as appropriate. National Kidney Foundation and Urologic Diseases Information Clearinghouse. 3 Information Way, Bethesda, MD 20892-3580. (800) 891-5390. 〈http://www.niddk.nih.gov/health/kidney/nkudic.htm〉. Dialysis — A process of filtering and removing waste products from the bloodstream. Two main types are hemodialysis and peritoneal dialysis. In hemodialysis, the blood flows out of the body into a machine that filters out the waste products and routes the cleansed blood back into the body. In peritoneal dialysis, the cleansing occurs inside the body. Dialysis fluid is injected into the peritoneal cavity and wastes are filtered through the peritoneum, the thin membrane that surrounds the abdominal organs. 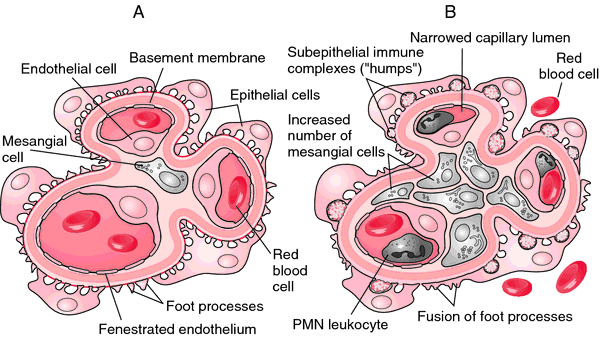 Glomeruli — Groups of tiny blood vessels with very thin walls that function as filters in the kidney. Glomeruli become inflamed and are destroyed in the disease process of glomerulonephritis. Renal — Relating to the kidneys, from the Latin word renes. a variety of nephritis characterized by inflammation of the capillary loops in the glomeruli of the kidney. It occurs in acute, subacute, and chronic forms and may be secondary to an infection, especially with the hemolytic streptococcus. Histologic appearance of acute glomerulonephritis. A, Normal glomerulus. B, Glomerulonephritis. The glomerulus appears hypercellular and the capillaries are narrowed or occluded. From Damjanov, 2000.
diffuse glomerulonephritis a severe form of glomerulonephritis with proliferative changes in more than half the glomeruli, frequently with epithelial crescent formation and necrosis; it is often seen in cases of advanced systemic lupus erythematosus. lobular glomerulonephritis (membranoproliferative glomerulonephritis) a chronic glomerulonephritis characterized by mesangial cell proliferation and irregular thickening of the glomerular capillary wall. There are two subtypes: Type I is marked by subendothelial deposits and activation of the classic complement pathway. Type II is marked by heavy deposits in the glomerular basement membrane and activation of the alternative complement pathway. Both types occur in older children and young adults and follow a slowly progressing course with irregular remissions ultimately resulting in renal failure. membranous glomerulonephritis a form characterized by proteinaceous deposits on the glomerular capillary basement membrane or by thickening of the membrane, with circulating antigen-antibody complexes indicating immune complex disease; it may be secondary to any of numerous other conditions. In some cases it may develop into the nephrotic syndrome. Called also membranous nephropathy. rapidly progressive glomerulonephritis acute glomerulonephritis marked by a rapid progression to end-stage renal disease and histologically by profuse epithelial proliferation, often with epithelial crescents; principal signs are anuria, proteinuria, hematuria, and anemia. Plasmapheresis or high doses of corticosteroids may lead to recovery of renal function. Renal disease characterized by diffuse inflammatory changes in glomeruli that are not the acute response to infection of the kidneys. /glo·mer·u·lo·ne·phri·tis/ (glo-mer″u-lo-nĕ-fri´tis) nephritis with inflammation of the capillary loops in the renal glomeruli. acute glomerulonephritis an acute form characterized by proteinuria, edema, hematuria, renal failure, and hypertension, sometimes preceded by tonsillitis or febrile pharyngitis. chronic glomerulonephritis a slowly progressive glomerulonephritis generally leading to irreversible renal failure. diffuse glomerulonephritis a severe form with proliferative changes in more than half the glomeruli, often with epithelial crescent formation and necrosis; often seen in advanced systemic lupus erythematosus. IgA glomerulonephritis IgA nephropathy; a chronic form marked by a hematuria and proteinuria and by deposits of immunoglobulin A in the mesangial areas of the renal glomeruli, with subsequent reactive hyperplasia of mesangial cells. lobular glomerulonephritis , membranoproliferative glomerulonephritis a chronic, slowly progressive glomerulonephritis in which the glomeruli are enlarged as a result of proliferation of mesangial cells and irregular thickening of the capillary walls, which narrows the capillary lumina. membranous glomerulonephritis a form characterized histologically by proteinaceous deposits on the glomerular capillary basement membrane or by thickening of the membrane; clinically resembling chronic glomerulonephritis, occasionally with transient nephrotic syndrome. A form of nephritis characterized by inflammation of the renal glomeruli. an inflammation of the glomerulus of the kidney, characterized by proteinuria, hematuria, decreased urine production, and edema. Kinds of glomerulonephritis are acute glomerulonephritis, chronic glomerulonephritis, and subacute glomerulonephritis. Also called membranous nephropathy. Nephrology Inflammation of the renal glomeruli, associated with fluid retention, edema, HTN, proteinuria. See Acute glomerulonephritis, Capsular 'drops. ', Casts, Chronic glomerulonephritis, Heymann glomerulonephritis, Membranoproliferative glomerulonephritis type 1 and 2, Membranous glomerulonephritis, Mesangial proliferative glomerulonephritis, Crescents, Deciduous tree in winter appearance, Dense deposits, Fingerprints, Fusion of foot processes, Heymann glomerulonephritis, Humps, Poststreptococcal glomerulonephritis,'Shunt' nephritis, Spike, Tramtrack pattern. Renal disease characterized by inflammatory changes in glomeruli that are not the result of infection of the kidneys. Acute or chronic inflammation of the GLOMERULI of the kidneys. The condition is mainly caused by immune complexes. These are bacteria, such as streptococci, to which are linked quantities of antibody insufficient to destroy them. Glomerulonephritis commonly affects children causing fever, headache, loss of appetite, vomiting and puffiness of the face and body (oedema). The urine contains blood and protein and the kidneys may, briefly, cease to function. Recovery is usual but there may be persistent abnormality of kidney function. a variety of nephritis characterized by inflammation of the capillary loops in the glomeruli of the kidney with secondary tubulointerstitial and vascular changes. It occurs in acute, subacute and chronic forms and may be secondary to infection or immune mechanisms. caused by deposition of immune complexes on the glomerular basement membrane or autoantibodies against the glomerular basement membrane. a form in which all glomeruli are affected, with accentuation of the lobulation of the glomerular tufts; it is marked by constant proteinuria and microscopic hematuria. a chronic, slowly progressive glomerulonephritis in which the glomeruli are enlarged as a result of proliferation of mesangial cells and irregular thickening of the capillary walls, which narrows the capillary lumina; the onset is sudden, with hematuria, proteinuria or nephrotic syndrome and a persistent reduction in serum complement levels and deposition of activated complement components in the glomerular capillaries. Occurs in Finnish-Landrace sheep and is the most common glomerulopathy seen in dogs. diffuse and irregular thickening of the basement membrane where there is diffuse granular deposition of immunoglobulin and complement. The most common type of glomerular disease in cats. glomerular changes are principally those of cellular proliferation. 6%), Henoch-Schonlein purpura glomerulonephritis (HSP-GN, 4. Focal segmental glomerulosclerosis (FSGS) was the leading histopathological diagnosis, found in 23% (n=46) of all biopsies, followed by membranous glomerulonephritis (12%, n=24). This lesion is referred to as pauci-immune glomerulonephritis and it is indistinguishable from other forms of AAV that involve the kidney. 9 12 F; 3 M; 5 UN glomerulonephritis Membranous glomerulonephritis 17/11. Hygiene hypothesis and prevalence of glomerulonephritis. 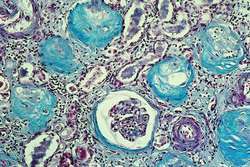 Glomerulonephrite rapidement progressive a ANCA revelant une endocardite infectieuse subaigue (Rapidly progressive ANCA positive glomerulonephritis as the presenting feature of infectious endocarditis)," La Revue de Medecine Interne, vol. This case is also notable for the association between acute HBV infection and biopsy-proven TMA with immune complex mediated glomerulonephritis causing acute allograft dysfunction. Bomback AS (2014) Eculizumab in the Treatment of Membranoproliferative Glomerulonephritis. It is useful in edema due to various forms of renal dysfunction, including nephrotic syndrome, acute glomerulonephritis and chronic renal failure.